It felt just like a boxing match. Michael Buffer: At the edge of the table, wearing an extra-roomy white dress and a trusty spandex leggings, weighing a hundred and five pounds, a long-time buffet-conqueror, a dire lover of food-- the challenger: Triiiiix Deseeeeooo! 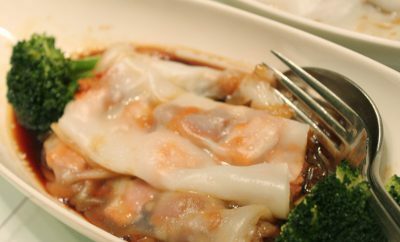 In front of her, lined-up side by side on a Lazy Susan, hot, plump, and steamy, Shang Palace's most-sought after dishes, give it up for the dim suuuuuum! Ladies and gentlemen, let's get ready to rrruuuumble! I swear, that's what's going on my mind while seated in a function room one lunchtime at the Shang Palace. 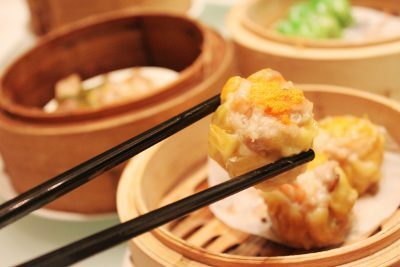 Stuff yourselves silly with as many dimsum you can at P888++! John Kow, Food and Beverage Manager of Makati Shangri-la, tells us more about this famous offer of the hotel's Cantonese restaurant. 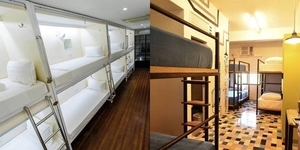 Our group agreed to meet at the opulent Shang Palace on the day of the challenge. 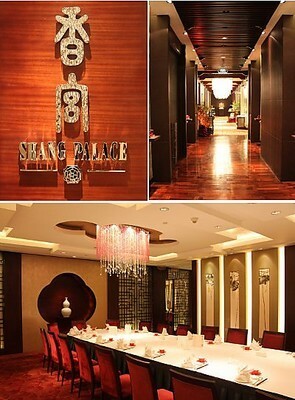 Shang Palace is Makati Shangri-la's Chinese outlet, which serves Cantonese fare. 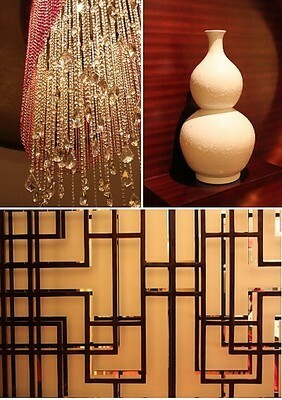 True to its name, the restaurant is nothing short of what a Chinese royalty deserves. 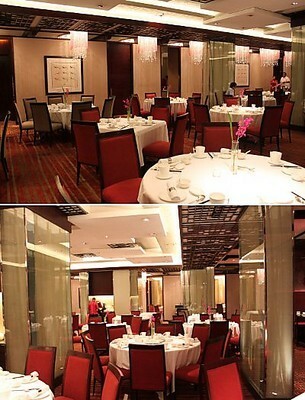 The design of the place is extravagant; the kind with large banquet halls, chandeliers, and well-groomed Chinese-red carpet. At one point during my tour of the restaurant (I arrived ahead of everyone else), I was convinced that an emperor in his silk robes will appear at the cue of the gong. It was that fancy! Finally, my companions arrive. 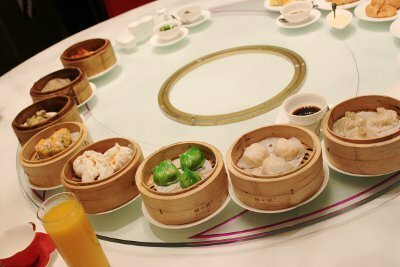 We were to avail of their Dim sum Plus Promo,which is available during lunch from Monday to Saturday. 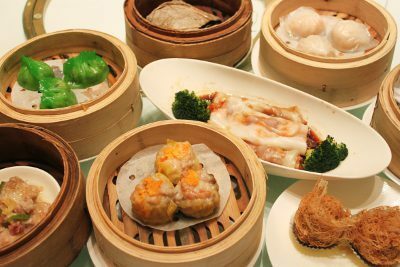 I knew beforehand that for P888++ per person, this dim sum-all-you-can promotion entitles the diner unlimited orders of dim sum. What I did not expect is that, for this rate, unlimited serving of the soup of the day, an appetizer, rice (which you will likely skip anyway), noodles, congee, one order of main course, and dessert are also included. 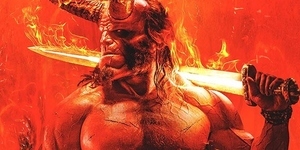 For these, I wasn't prepared. As soon as we were settled, the menu that listed the items we are allowed to order was handed to us. 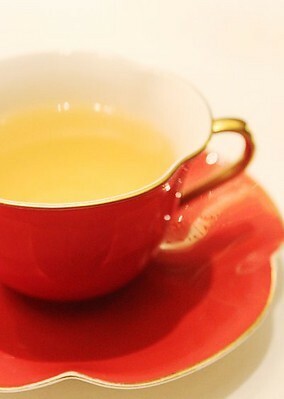 A serving of tea (P80) soothed our then clamoring stomachs while we were deciding which ones to choose from among the lengthy list. It was quite hard to go through the menu since the dim sum aren't listed in their more familiar name. 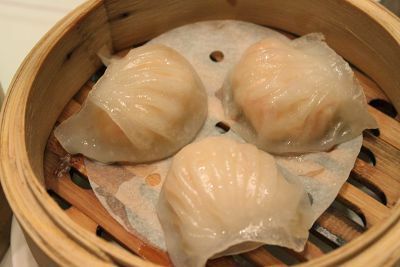 For instance, Hakaw, my all-time favorite dumpling, is listed as Steamed Giant Shrimp Crystal Skin Dumplings. Well, that was quite easy to identify, but for the other items, we had to consult our standby wait staff, who was, in all fairness, knowledgeable and ready to help. We agreed to order around ten kinds of dim sum, to be shared by three women. The challenge is to go through everything; have a piece from each kind. No skipping, no ordering of dessert until everything has been tasted. One by one, the dim sum baskets and saucers arrived. There were a lot. It was at this moment when my mind, probably because it was half-anxious and half- excited, that I imagined Michael Buffer's boxing introduction. Upon my friend's go signal (ding, ding, ding), I started my buffet with the fragile Steamed Shanghai Xiao Lung Pao. Challenging, brothy, and sour, it proved to be a great engine starter. 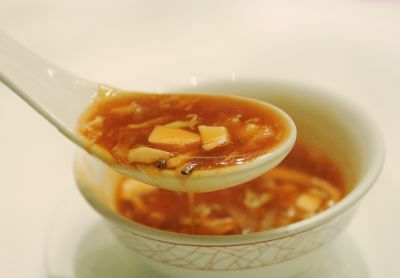 Pray that it doesn't burst upon its transfer to your spoon, the Xiao Lung Pao will surely delight your taste buds once it unleashes its soupy goodness inside your mouth. Do not forget to add a quarter of a teaspoon of black vinegar, it always makes this dish a little extra special. Next on the line-up was the Hakaw. I've tasted the best versions of Hakaw in Manila and I'm happy to report that Shang Palace's version of the fat and slippery dumpling didn't fail me. The shrimps were plump and juicy. The entire dumpling was a good mouthful. I tried to restrain myself from getting another helping but it was simply irresistible. I, a mere slave to Hakaws, gave in for another. The Hakaw won over me in this match. My next favorite dumpling, the Siumai or Steamed Pork Dumplings with Shrimps, came next. I found the piece decent, but not exactly remarkable, probably because my benchmark for this is all the way in Hong Kong. It was chunky alright-- each bit of the minced pork was discernible. But it didn't tempt me to go for a second serving. After having three steamed dumplings in a row, I decided to try the other varieties on the table: the flaky and sweet Baked BBQ Pork with Apple and Sesame, the interesting fried version of the Hakaw: HK Style Deep Fried Spring Roll,and the sticky but tasty Steamed Glutinous Rice Dumpling or “Machang” wrapped in traditional lotus leaves. This particular wave of contenders passed by in a blur. 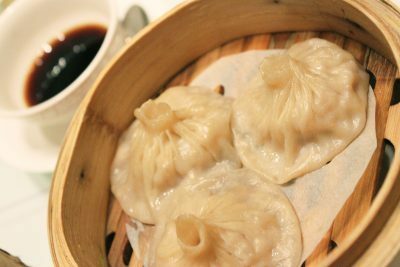 Slowly but surely, these dumplings were filling me! The best discovery of the day came after those dim sum, in the form of Deep Fried Taro Puff. 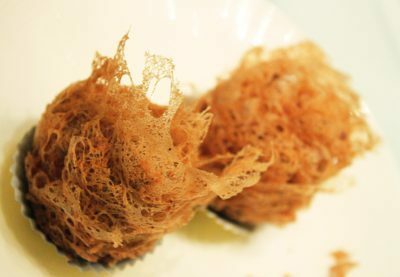 If you like food with interesting textures, the aesthetically pleasant taro puff will amuse you. It's crispy outside, then mushy within. 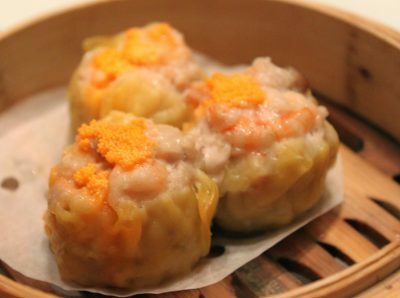 Consider the scallop dice at the core of the dim sum your bonus. 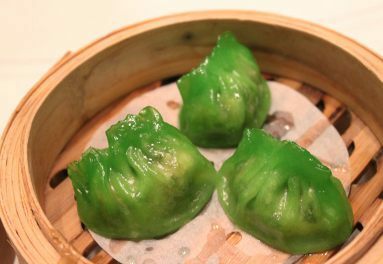 The brightly colored Spinach Dumpling was also surprisingly charming. Expect a crunch from the spinach stem and a small amount of pork broth from this alien green delight. By the time I finished the piece, I found myself at the brink of surrendering. Man, these dumplings are deceivingly tiny but they are heavy on the stomach! 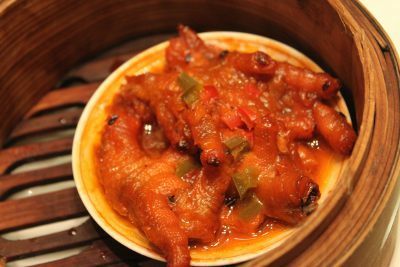 Just to break the monotony in flavor, and that dizzying feeling of fullness I was getting, I got myself a piece of the Steamed Chicken Feet, which screaming hot flavor gave my tongue the much needed jolt. If it were just me, I'll leave the Steamed Rice Rolls with Honeyglazed Pork alone. I've clearly reached my quota. I've had enough dim sum to keep me from wanting them for a good month. But I was one dim sum away from winning the challenge. I knew I had to continue. Reluctantly, I force fed myself a helping from the gelatinous rice rolls. “Ohrrmyyy!” I told my friends with my mouth full, breaching the proper table manners. With a little help from the Sichuan Hot and Sour Soup, I slurped, not swallowed, the portion. It was extra slithery, extra delicate, and extra soft. The pork broth that came along the minced bits was also remarkable. “This is the best,” I declared, before I put the entire serving in my plate. I almost never made it, but I did! I went through everything; had a piece from each kind. I didn't skip, nor ordered for dessert until everything has been tasted. I, clearly, am a winner by unanimous decision in this dim sum challenge. I reckon Michael Buffer has to add “Dim sum buffet champion” in his script, the next time I'm introduced in a challenge, no?